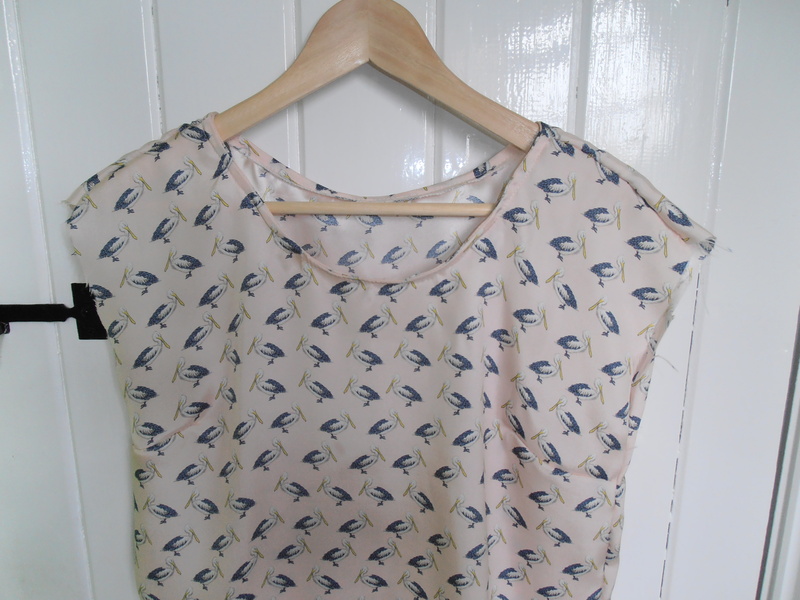 In a fit of madness I decided to eschew using facing for this top and instead finished the neckline with bias binding. To make matters worse (OK this is really embarrassing) I decided to use my overlocker to speed up the process – why, why, why – and now the neckline is stretched (yes I had stay stitched it but I still managed to stretch it). It’s a silk crepe so not the easiest fabric to unpick. I still have about a quarter of a metre left which I could use for facing. Alternatively I could put a collar on it, however it has to be a proper adult collar, I’m still firmly of the belief that no one over the age of 10 should dress like Peter Pan. What do you think? Can I rescue it? I am inordinately pleased with my new jacket but I really needed something to go with it to complete the outfit. And now I have it! 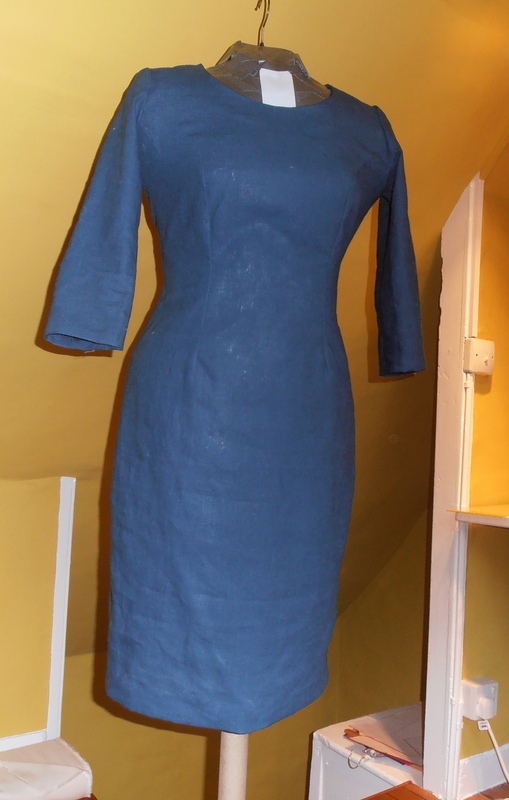 It’s a very simple blue linen dress which I can wear under the jacket for work. People talk a lot about “work appropriate” clothing on blogs but I’m never completely sure what they mean as different work places have different requirements. I work in the City which means suits and smart dresses, colours tend to be sober, hemlines not too short and cleavages safely tucked away. Having said that there is nothing wrong with a hint of sexiness; high heels and pencil skirts or a jacket cut to show off a slim waist. Comfort is also important, I hate being bothered by ill-fitting clothes or being too cold. Sleeves are a must, they make wearing a jacket more comfortable, keep you warm and ensure any wobbly bits are safely hidden away. Work wear tends to get worn a lot so I like good quality fabrics that are easy to clean and don’t need expensive dry cleaning every time I wear them. In short I need to look smart, elegant, comfortable and conformist. On a recent trip to Brighton I found some lovely French Navy linen in Ditto fabrics. Have you ever been to Ditto? It’s the most fabulous little shop selling all sorts of lovely fabrics including some quite unusual pieces. Expect to see more of their wares in future posts! The linen is quite a heavy fabric and has been a joy to sew, absolutely stable and does everything you ask of it. 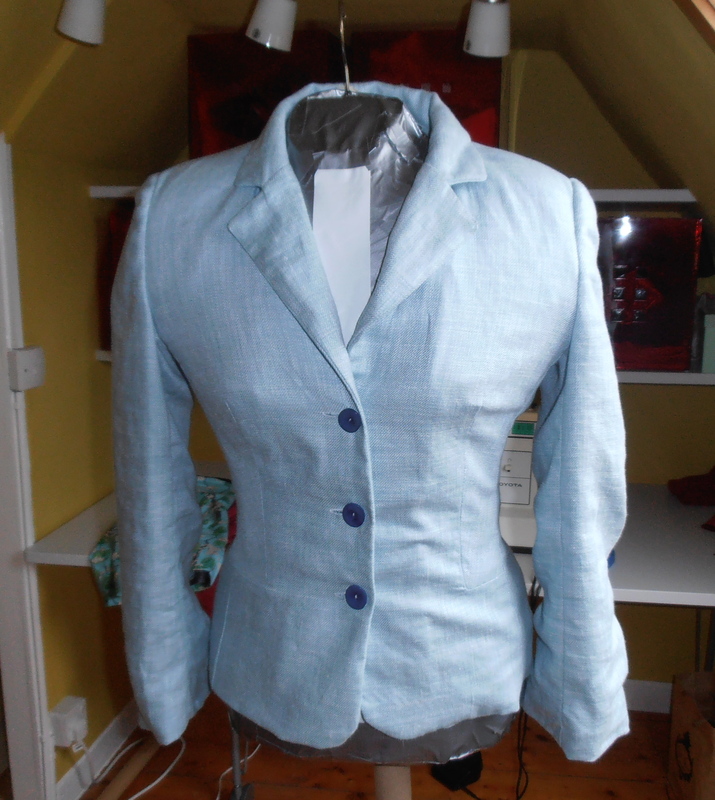 It also goes beautifully with the duck egg linen silk that I used for the jacket. As I mentioned in my last post I wanted to have a play with my blocks. I started by joining the bodice and skirt together, moving the skirts darts so they sat under the bodice’s and putting in bust darts to take up the excess. The toile I made was ok but a bit boring. So I then decided to move the bust dart up to the armscye and turn it into a princess seam. It’s not actually a full princess seam because I wanted a plain skirt front. So the dress has long curling darts running from the sleeve seam down the front and stopping at about hip level. The neckline and facings were copied from a simplicity pattern. The skirt was pegged and I used my sleeve block to add three quarter length sleeves with elbow darts. If I’m being completely honest it is a rather boring dress but it fits me like a dream and I’ll have the satisfaction of knowing that I did it all myself! Looking back on the post I wrote on January 1 with my top 5 sewing goals for 2013 (actually turned out to be top 6) I see that I am not doing to badly: goals 1 (making tops for work) and 5 (more knitting) need more work but the others are well in hand. Goal 2 was to make a jacket which I’ve done. Goal 3 was to get to grips with my overlocker, which I’ve also done, the basic functions anyway – I’ve used it to neaten seams and sew knits up and I can thread it which is probably the only complicated part of using an overlocker. Goal 6 was about waistbands and I can report that the waistbands on the three spring skirts I made for me and the girls are all perfect, only one of these skirts had a traditional waistband but I managed to make it up neatly with no additional bulk or problems due to fitting it the wrong way round. This leaves goal number 4 – drafting clothes with my blocks. I came away from my courses at Raystitch full of inspiration and enthusiasm but somehow the reality of drafting clothes from the blocks has proved more difficult than I thought. I understand the basic principles but like everything else in life it clearly takes a bit of practice to get them right. I started out drafting a pair of trousers but somehow my block, which fitted perfectly in the class, now doesn’t seem to fit at all. I have too much fabric in the front crotch and the thighs have mysteriously shrunk (the alternative is that my body has got bigger but I don’t think that’s the case). I think I can fix these problems but I need a day to play with it. I then tried to make a blouse with a pleated neckline. These necklines have been everywhere this last year and in theory they should be simple to recreate. Drafting it looked easy but unfortunately when I put it on I found I’d managed to place the outer pleats in such a way that they created a very unflattering fold which ran out to my arm pit. In disgust I have put the blouse away. What I needed was a very simple project to help me get my confidence and this turned out to be my spring skirt. Dead simple, no manipulation of the block beyond tapering the sides slightly to turn it into a pencil skirt. I’ve worn this skirt a lot, it’s comfortable and pretty and exactly the sort of thing I expected to be making when I started sewing. So 4 out of the 6 goals completed and 2 to do. I hope you’ll agree that it’s not bad for 5 months of the year. Looking back on my blog entries I see that I first wrote about this in early March, so it has been a long time gestating. I spent a long time fitting the toile, taking all your useful advice, adding in the shoulder pads, moving the darts and so on and in the end had a toile which was, well, completely over fitted. So I then started again and, with the help of my sewing friend, just took a centimetre out of each of the seams on the back (i.e. 4 cm in total) at the waist level. Having spent so long on the toile the seasons had changed and the wool fabric I had planned to use was looking a bit too wintery. 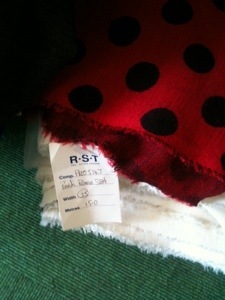 A trip to Rolls and Rems in Lewisham yielded some pale duck egg blue linen and silk. It is a very pretty fabric with a bit of sheen to it, being linen it does crease a lot – you can probably see on the picture above. I matched it with some French navy coloured lining fabric, it’s a lovely colour and a perfect match for the jacket but possibly a bit too heavy. I had originally intended to do a full tailoring job but as fitting the toile took so long I decided to just follow the instructions Burda gave – which meant a lot of winging it as they weren’t as comprehensive or clear as I could have hoped for. Inserting the sleeves was fun, I took them slowly; pinning and then tacking them in producing a near perfect sleeve head. It was only when I tried the jacket on did I realise I’d sewn them in back to front! 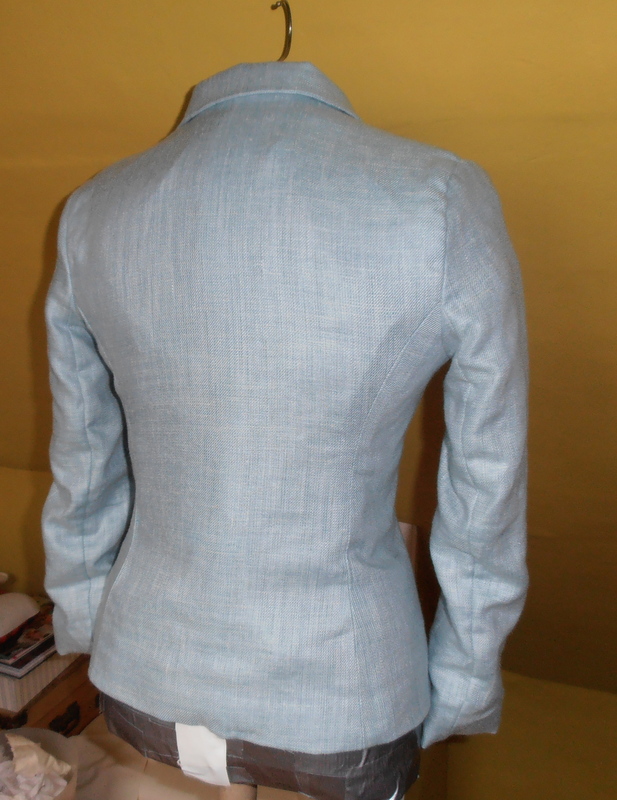 The lining also caused me problems, the pattern suggested you included a 2cm ease pleat at the back. Unfortunately my lining fabric has virtually no give in it what so ever so 2cm was not nearly enough and I found I couldn’t move my arms at all. 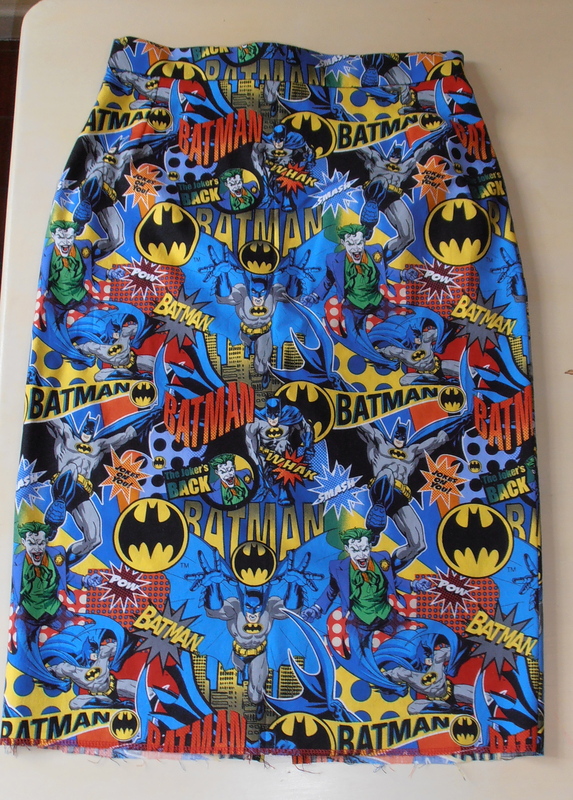 I resolved it by cutting a seam up the back and adding in a stripe of fabric – I didn’t have enough lining fabric to do this so the strip is in the shell fabric – it’s a bit unusual but doesn’t look too untidy. 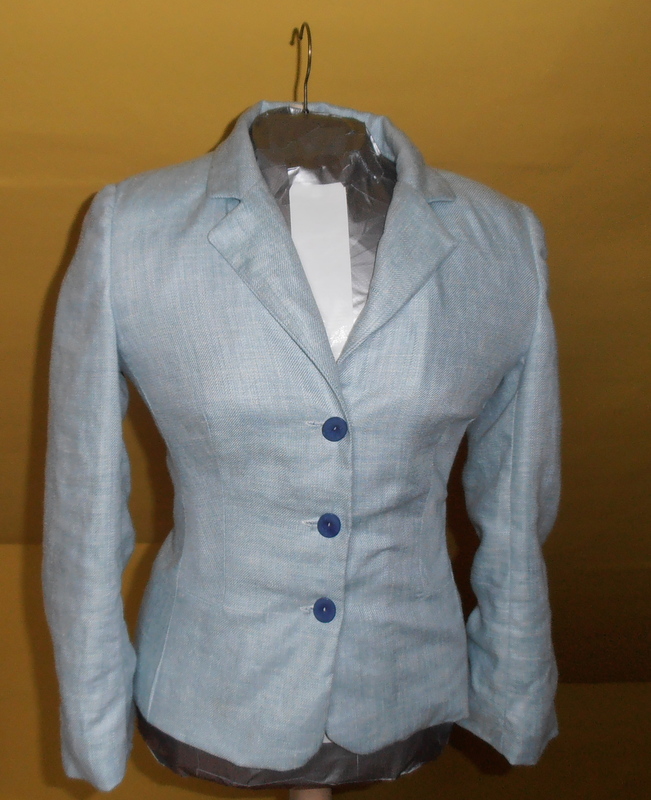 If I make the jacket again I will ensure a much wider ease pleat is added. I’m very pleased with the finished jacket. It fits beautifully and is very comfortable to wear. 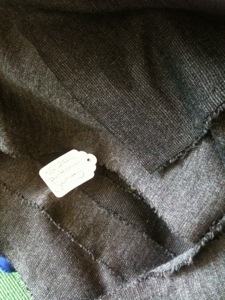 I have some Navy linen in the stash that I think will make a perfect dress or skirt to go with it. Does is ever happen to you? I put on my skirt for work in the morning, perform my usual commute and when I get to the office it has somehow spun round so the back is now facing forward with the fabric twisted up around my thighs and several inches more of leg on display than I’d prefer. I should explain my skirts are part of a suit and are generally straight or pencil skirts. They are usually made of wool or a wool mix and fully lined. I wear them over tights and, whilst I am commuting, comfortable shoes. I carry shoulder bags which rub against my side and may contribute to the problem. The issue happens whether I am wearing a coat or not. I’d love to know what causes this and how I could stop it from happening. Is it a fit problem or is it caused by something else? Is there anything I can do to prevent it? A few posts ago I admitted that I didn’t know what a ponte knit was and that I’d never seen one for sale in the UK. A few of you came out of the woodwork and also admitted you didn’t now what a ponte knit was. Well today I took the bus over to Rolls and Rems in Lewisham and look what I found! I can report both fabrics were some sort of double knit.